A friend commented to me that he felt I wasn't grounded. I took his comment seriously. So how do you ground yourself? My initial answer is through spiritual friendships, meditation and time out to reconnect with myself. Retreat would be good. Here's a link to my photos on Facebook, looking at the Rupas at the Met. Also saw the Picasso exhibit. 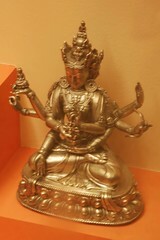 I love learning about new Bodhisattvas, apparently this is a manifestation of Tara. Vajramati has been away and we miss him. He's sent these photos. One's personality is not set in stone. It may seem as though there is nothing you can do about who you are, but if the Dharma is about anything it is about our inherent capacity to change our inherent conditioning. Telling my story was a powerful activity for me, and I could see that others felt closer to me, grateful that I shared it with them. I was grateful to hear other's stories and felt I was closer to them. It's been a very powerful sangha building activity. I recorded mine, and played it to some friends. One friend suggested I listen to a Ted Talk, about the importance of why. I found the talk on YouTube. It's by Simon Sinek, who I must admit I know nothing about, except what I see in this Ted Talk. Now I thought I did OK on the why in my little talk, but I thought it would be an interesting practice to elaborate further here. In my talk I talked about how great the other guys were. So on one level the why of Dharma practice for me is because I have met really amazing people that I really respect, and I like to be around them. But I met awesome people in social work school, I meet awesome people all the time. There is a framework that keeps me meeting these awesome people every year on my ordination retreats, but people get ordained and generally stop coming after a while. (You're allowed to keep coming for a while after ordination.) The larger sangha is awesome. Lots of people come through NYC, and hook up with the sangha, and they are always really cool, interesting soulful people, whom I like to be around, I like to get to know better. One day on retreat, I was crying a lot in meditation. I was experiencing a kind of primal sadness that is hard to describe, that happens when I meditate a lot. When I came down to my room, on my bed, was a brownie. Someone saw me crying, or maybe just wanted to do something nice, and they left the brownie as a kind thing. Maybe they put a brownie on everyone's pillow and my roommate already ate his. It didn't matter. When I wondered at who could have done that, I thought, "Everyone here could have done that." That's how cool everyone is in the male ordination process that I spend time with on retreat, and the order members who support the retreat. The other why I mentioned in my talk was that I felt meditation was really healthy. I'm not just meaning feeling good after lifting weights, I mean I feel more healthy in that I feel more receptive to others, I see the lines of more pure actions, how I can positively influence others, I see what my "why" is more clearly. I gain clarity, I process my trauma so that I don't spit it back out unknowingly. I went on a retreat at the end of 2002 at Aryaloka, in Newmarket New Hampshire. I meditated much of the day, went for walks, talked with others, ate healthy vegetarian food, and learned to love chanting (called puja) and read. 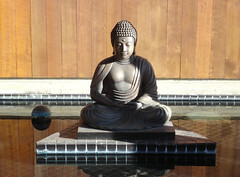 Enlightenment came out of meditative experience for the Buddha. I touched on something that blew my mind, I can't even say what it is. My friend talks about glimpses over the wall, and I think the glimpse over a wall on retreat, it's beyond words. Not beyond words in terms of enlightenment, I'm not saying that. I'm just saying it was mind blowing in a healthy way. Energy is another why I practice the Dharma. I get energy from meditation, reading the Dharma, my friendships and interaction with Sangha. The practices of Buddhism feel very meaningful. When I am with other people in this way I feel connected to something bigger than myself. My grandfather used to criticize my atheism, "but there's nothing bigger than yourself!" Well, in Buddhism that's perhaps the Transcendental Principle or The Dharma or the Three Jewels. The meaning in practicing the Dharma, experiencing sangha, gives me energy. The Dharma feels profoundly respectful and encouraging. There are a wide variety of practices, from chanting, to altruistic activities, to meditation, to studying and thinking, to spiritual fellowship. Buddhism is the pragmatic advice on the path to enlightenment; from that perspective there is no Buddhist philosophy or theology. You can look at the Yogacara as a philosophy, but I think it's more like a psychological outlook, that grows out of meditative experience. The respect in the Dharma is that we test our own experience about whether something is beneficial for us. It's encouraging in that the sangha supports one. We can use consolation as well as confrontation, self and other power. But I have felt profound encouragement, respecting me. The why is the inner journey. We've climbed the tallest mountains, gone to the poles, gone deep into the ocean, gone into outer space, the moon. People have done amazing things. There's a marathon that's 135 miles through a hot desert, the Badwater. But can we really say we understand humans in their depth and potential? Do I understand myself. They say you go into therapy sure you know who you are, and come out uncertain and curious. Since I'm a psychotherapist I see the journey in therapy as parallel and complementary, as in any spiritual journey. I know some dislike the importing modern psychology into the Dharma, they feel they have quite enough with the Dharma, thank you. I do it not because I think others should do it, but because that's who I am. "The aim of mindfulness is to know suffering fully. It entails paying calm, unflinching attention to whatever impacts the organism, be it the song of a lark or the scream of a child, the bubbling of a playful idea or a twinge in the lower back. You attend not just to the outward stimuli themselves, but equally to your inward reactions to them. You do not condemn what you see as your failings or applaud what you regard as success. You notice things coming, you notice them go. Over time, the practice becomes less a self-conscious exercise in meditation done at fixed periods each day and more a sensibility that infuses one's awareness at all times." So they "why" of Dharma practice is for me, is that it's the most meaningful, healthy, energizing, supportive, connecting, helping, respectful, thing I have found on the inner journey.